The attack on the mobile market company of Satya Nadella passes by a global operating system. And by the special care of the hardware. The hands on the products presented in NY. NEW YORK – Two new Surface, two new Lumia, the surprise dell’Hololens and a Band reinvented. Microsoft did not miss the twists to its event in New York . Here are our first impressions hot new products giant of Seattle. The Surface Pro 4 is the natural evolution of the three . The display seen close impresses resolution and touch response of the digital pen, is broader and new keyboards cover finally have a trackpad worthy of the name is a race very pleasant to the touch. The Surface becomes short, a machine accomplished, improves performance and usability. Of course the real parameters will be measured in a more thorough test but the first impression is very positive. TheSurface Book instead is a very “designed”, powerful yet unobtrusive with its lightweight metal chassis, and inside has all the power a user PC evolved could want. Here too great detail on the keyboard, the key travel is set at 1.6 mm, the ideal spot according engineers in Redmond and in fact touch is very quick and the ergonomics of the keys is felt. The monitor-tablet that you can detach it works very well, just press a button and the system will go off, then just lift it. From that moment is a tablet, with its battery, distributed throughout the body machine. You can also hang up on the contrary. 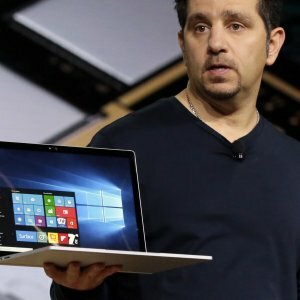 The Surface Book is a machine designed for the power user, technically is the most powerful laptop market. Watching him drive two monitors simultaneously 4K is impressive, and the starting price is interesting. With new Lumia instead Microsoft redefines its line of smartphones . Are objects other than the above with the same name, aim high with a significant power entrusted to a relatively new operating system and capable of extending the user experience until they become small Pc. There is nothing left of these old Nokia Lumia 950 and XL 950, Microsoft has opted for a real reboot of the product line. The challenge launched to the market is relevant but the ecosystem Windows 10 this time could make a difference. Hololens is still under construction, the commercial product is far but the possibilities are already clear . There is no doubt that the market for augmented reality will be one of the next to take off here and Microsoft focuses on Windows 10, this is the heart of Hololens. Developers should therefore already have some of the work done, and the fields of application for such a device are numerous, from games to professions and medicine. We’ll know more with time. The band second generation is a curious and interesting object . It is grown in technology and now is no longer a simple fitness tracker with some function smart, but a real smartwatch designed very particular and through the voice assistant Cortana, can do much more than before. Of course the focus is health and physical activity, but you can communicate and stay connected with the world without using your smartphone. The band, however, is not waterproof but withstands rain and sweat. The wrist is light and the large vertical display is easy to read and responds well to touch. Again, these applications will be critical.